New Japanese activism – Prime Minister Shinzo Abe of Japan is in Mongolia to strengthen the ties between the two countries. It is about economic relations and energy, and also about North Korea. Then, April 8 he will host Mexico in Tokyo as part of the belated Campaign to join the Trans-Pacific Alliance. 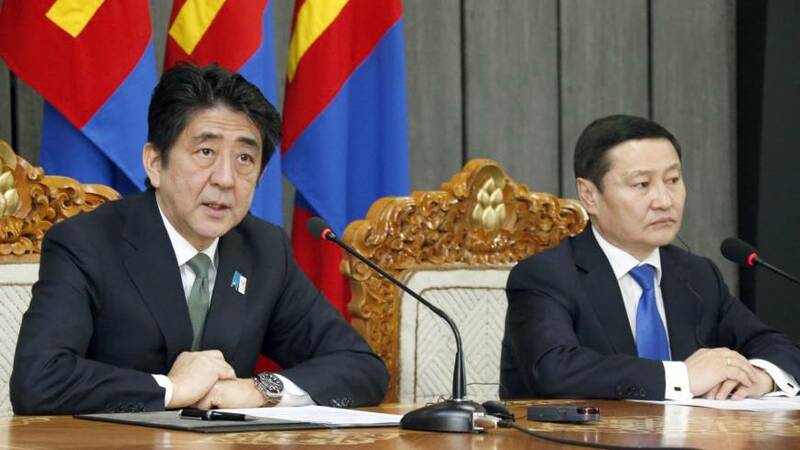 ULAN BATOR – After meeting with Mongolian President Tsakhia Elbegdorj and Prime Minister Norov Altankhuyag in Ulan Bator, Abe told a news conference the two sides will accelerate ongoing bilateral negotiations toward inking a free-trade accord. The two sides agreed to hold a third round of trade liberalization talks in the Mongolian capital from Tuesday. “As Mongolia is rich in natural resources, Japan’s technological cooperation will lead to a win-win scenario for both countries,” Abe, the first Japanese prime minister to visit Mongolia in nearly seven years, said after the talks. Abe also pushed the participation of Japanese companies in developing one of the largest coal deposits in the world, at the Tavan Tolgoi site in the Gobi Desert, during the talks. Japan hopes to secure cheaper supplies of natural resources abroad while its nuclear power stations remains stalled in view of the Fukushima disaster. The suspension of atomic power plants will drive up utilities’ fuel costs for the operation of thermal power stations to a sky-high ¥3.2 trillion in fiscal 2012, which ends Sunday, far in excess of levels seen before the 2011 meltdowns crisis at the Fukushima No. 1 plant. As well as its abundance of coal, Mongolia is also known for rich mineral resources such as gold, copper and uranium, while rare metals and rare earths deposits could also possibly be extracted. Aside from economic issues, Tokyo also considers Mongolia an important ally from a diplomatic and security perspective since it has diplomatic relations with North Korea — unlike Japan, which has no formal ties with the communist country — and borders China to the south and Russia to the north. On North Korea, Abe said the two countries had agreed to deal with its recent provocations to the international community in line with U.N. Security Council resolutions. Given Ulan Bator’s ties with Pyongyang, Abe was especially eager to secure its support in resolving the long-standing issue of the North’s abductions of Japanese nationals in the 1970s and ’80s, government officials said. Last November, Ulan Bator hosted the first talks between senior Japanese and North Korean officials since 2008 on the abduction issue. Meanwhile, Japan, the largest donor to Mongolia, also intends to provide technical assistance to help the country cope with serious air pollution in the capital and assist the building of new transport infrastructure as a way of alleviating heavy traffic in and around it. Japan was Mongolia’s fourth-largest trading partner last year, when the fast-growing country’s economy jumped 17.3 percent from a year earlier. China, Russia and the United States occupied the top three positions. Japan and Mexico are arranging to hold a summit for Prime Minister Shinzo Abe and President Enrique Pena Nieto in Tokyo on April 8, when Japan will kick off its diplomatic campaign to join the Trans-Pacific Partnership negotiations, government sources said. As of today, Roger Pulvers takes leave of Counterpoint, for which he has written weekly since its inception on April 3, 2005. In his final three columns, he set out to consider in turn Japan in the past, present and future. This is the concluding part of that trilogy. US Foreign Policy Rebalance towards East Asia and the Maritime Disputes in the Seas off China: a Wahington DC Review – December 13, 2012. East Asia’s Maritime Disputes and the US Rebalance. Please RSVP by following this link. The panelists will address East Asia’s maritime disputes in the context of the US rebalance to Asia. The discussion will cover the future of the rebalance, naval strategy, and A2/AD. Mr. Le Mière is Research Fellow for Naval Forces and Maritime Security at the IISS. He is responsible for maritime analysis for the Institute’s flagship Military Balance and is currently working on a book about the South China Sea for the Institute’s Adelphi series. He was the editor of Jane’s Intelligence Review and Jane’s Intelligence Weekly until he joined the Institute in 2010. Mr. Le Mière studied Philosophy, Politics, and Economics at the University of Oxford and holds an MA in War Studies from King’s College London. Rear Admiral Michael McDevitt, US Navy (Ret.) is a Senior Fellow with CNA Strategic Studies. During his navy career, McDevitt spent his operational time in the Pacific, including a two year assignment in Sasebo, Japan. He held four at-sea commands, including an aircraft carrier battle-group. He was the Director of the East Asia Policy office for the Secretary of Defense during the George H.W. Bush Administration. He also served for two years as the Director for Strategy, War Plans and Policy (J-5) for US CINCPAC. McDevitt concluded his 34 year active duty career as the Commandant of the National War College in Washington, DC. He is a graduate of the University of Southern California and holds his Master’s Degree in US Diplomatic History in East Asia from Georgetown University. Dr. Ely Ratner is a Fellow at the Center for a New American Security focusing on US national security strategy in Asia, China’s foreign relations in the region, and the US-China bilateral relationship. Prior to joining CNAS, he was a Council on Foreign Relations International Affairs Fellow serving in the Office of Chinese and Mongolian Affairs at the State Department as the lead political officer covering China’s external relations in Asia. Dr. Ratner received his PhD in Political Science at the University of California, Berkeley and his BA from the Woodrow Wilson School of Public and International Affairs at Princeton University. His Holiness the Dalai Lama’s press statement at the United Nations Conference on Environment and Development (UNCED), Rio de Janeiro, Brazil – June 5, 1992. Address at Rio Earth Summit of 1992. I am extremely happy and feel great honor to be with you here. My basic belief is that the purpose of our life is happiness, and happiness depends on its own basis. I believe the basic base, or the cause of happiness and satisfaction, is material and spiritual development. Then again, human beings irrespective of our ability, knowledge, technology are basically a product of nature. So therefore, ultimately, our fate very much depends on nature. In ancient times I think, when human ability was limited, we were very aware of the importance of nature; and so we respected nature. Then the time came when we developed through science and technology; and we had more ability. Now sometimes it seems people forget about the importance of nature. Sometimes we get some kind of wrong belief that we human beings can control nature with the help of technology. Of course, in certain limited areas we can to a certain extent. But with the globe as a whole it is impossible. Therefore now the time has come to be aware of the importance of nature, the importance of our globe. You see, one day we might find all living things on this planet- including human beings-are doomed. I think one danger is that things like nuclear war are an immediate cause of concern so everybody realizes something is horrible. But damage to the environment happens gradually without much awareness. Once we realize something very obvious to everybody it may be too late. So therefore I think we must realize in time our responsibility to take care of our own world. I often tell people that the moon and stars when remaining high in the sky look very beautiful, like an ornament. But if we really try to go and settle there on the moon, perhaps a few days may be very nice and some new experience may be very nice and some new experience may be very exciting. But, if we really remain there, I think within a few days we would get very homesick for our small planet. So this is our only home. Therefore, I think this kind of gathering concerning our environment and the planet is very useful, very important ‘and timely. And of course things are not easy, so I don’t think all problems could be solved at once through such meetings. However, this kind of meeting is very helpful to open eyes. So, once the human mind wakes up humans such intelligence, that we may find certain ways and means to solve problems. But sometimes we just take everything for granted and don’t care, and this kind of negligence is also a danger. So, such meetings on a critical situation, if approached with an open human mind and eyes, are important and useful. These are my feelings. His Holiness the 14th Dalai Lama in Vienna, Austria. A Tibetan report of the visit that touches on Buddhist Happiness and Sustainability concepts. His Holiness Meets the Austrian Chancellor, attends a Science Symposium and the European Rally for Tibet. The 14th Dalai Lama mid-May 2012 Europe-trip took him to the UK (where he received The Templeton Prize for Progress Toward Research or Discoveries about Spiritual Realities – in front of 2000 people at the St. Paul Cathedral in London and met in private with the Prime Minister and his Deputy), Slovenia, Belgium, and Austria (where he was received by two States – Koernten and Salzberg, and in private by the Federal Chancellor and the Vice Chancellor). Vienna, Austria, 26 May 2012 – The sun shone and a small crowd of well-wishers smiled warmly as His Holiness arrived opposite St Stephen’s Cathedral to be met by Cardinal Christoph Schönborn, the Archbishop of Vienna. They were almost immediately joined by the Austrian Chancellor, Werner Faymann and the three went into a meeting together. Standing at a balcony window nearby, Cardinal Schönborn took the opportunity to explain some of the restoration work that has been taking place at St Stephen’s, the most important religious building in Vienna, before the bells rang out calling him back to the cathedral. His Holiness and the Chancellor continued to discuss matters of mutual concern. Next, His Holiness drove to the University of Vienna to attend a symposium on Buddhism and Science: Mind & Matter – New Models of Reality, where he was welcomed by the Rector of the University, Heinz Engl. Describing it as a great honour for him to participate in the discussions, His Holiness noted that towards the end of the last century, scientists had begun to take a serious interest in the workings of our minds and emotions. He said he had been fascinated by how things work since he was a child and learned a great deal about how electricity functions from investigating the movie projector and generator that had belonged to the 13th Dalai Lama. About 40 years ago he began to learn about cosmology, neuropsychology and quantum physics and for nearly 30 years has been conducting regular dialogues with scientists. The purpose of these dialogues is, firstly, to extend human knowledge, not only in the material field, but also the inner space of our minds, and, secondly, through exploring such phenomena as a calm mind, to promote human happiness. With Mr Gert Scobel moderating, Prof Dr Anton Zeilinger, Prof Dr Klaus-Dieter Mathes, Dr Patrizia Giampieri-Deutsch made their presentations, which explored aspects of quantum physics, Madhyamaka philosophy and psychoanalysis. His Holiness hosted a lunch at his hotel for all the speakers that was also attended by Kalon Tripa, Dr Lobsang Sangay, social and human rights activist Bianca Jagger, former French Foreign Minister and co-founder of Médecins Sans Frontières, Bernard Kouchner and other friends who were in Vienna to attend the European Rally for Tibet. In the afternoon session of the Science symposium, Prof Dr Michael von Brück and Prof Dr Wolf Singer gave informative presentations on how the mind understands the structure of reality and the search for neuronal correlates of consciousness. A memorandum of co-operation was signed between Prof Geshe Ngawang Samten, Director and Vice Chancellor of the Central Institute of Higher Tibetan Studies in Sarnath, Varanasi, India and the Rector of Vienna University, Heinz Engl, providing for an exchange of students and scholars of the two institutions. Geshe Tenzin Dhargye, Director of the Tibet Center that has organized the various functions His Holiness has attended in Austria on this visit, offered his thanks to His Holiness and everyone who has participated. In the warm, late afternoon, His Holiness drove to Vienna’s Heldenplatz where 10,000 people had assembled for the European Solidarity Rally for Tibet. Addressing his dear brothers and sisters in the crowd, he told them how happy he was to be there and that he would like to first say a few words in Tibetan to the Tibetans present. He talked about the urgent need to protect the Tibetan environment, which because it is the source of many of the rivers that run through Asia is of value not only to Tibetans but millions of others too. He expressed the fear that once environmental damage has taken place it will take a great deal of time to recover. Distinguishing Buddhist religion, which is the business of Buddhist practitioners, from Buddhist culture, which, as a culture of peace, honesty and compassion, is worth preserving for the good of the world. Meanwhile, millions of Chinese are already showing interest in Tibetan Buddhist culture. His Holiness stressed that the damage and destruction of Tibetan Buddhist culture that has taken place was not because Tibetans were not interested, but because of the difficult political circumstances in which they find themselves. “Because of our Buddhist culture we are committed to the principle of non-violence. We are an example of a small community who have remained dedicated to pursuing our struggle through non-violent means, which is why your support is so extremely valuable and I want to tell you how much I appreciate it. Tomorrow afternoon, following a meeting with the press to highlight inter-religious harmony and several private meetings during the morning, His Holiness will board a flight from Vienna to return to India. The UN Convention on Combating Desertification (UNCCD) has its Parties now in Changwon City, Republic of Korea and expects there decisions to help the poor arid lands. We hope for good exchange of information and for Korea funding to projects in Sub-Sahara and Central Asia regions. The UNCCD tenth session of the Conference of the Parties (COP10) gets underway this morning, Monday, 10 October 2011, in Changwon City, Republic of Korea. This major conference will be attended by some 5,000 people, including the 194 Parties to the Convention to Combat Desertification (UNCCD). There are also a large number of other events taking place involving civil society and other organizations. It comes just four weeks after the United Nations General Assembly special session in New York, where more than 100 heads of states, heads of government or heads of delegation addressed the issues of desertification land degradation and drought (DLDD) in the context of sustainable development and poverty eradication. This sent a clear message about the global threat from desertification, land degradation and drought. World leaders committed to increased international cooperation to combat desertification at all levels. The outcomes of the COP will be of interest to every single issue debated now in the world – this because the arid lands of the world arw such a chunk of the underdeveloped world – not just of the oil rich member states of the UN. Interesting that the meeting was set up in the home state of he UN Secretary-General Ban Ki-moon. This may get us to think that no more appropriate location was found because the places where aridity is the familiar state of affairs just do not have trust in the UN that it will eventually help them. Let us hope thus that the States that are not coursed with aridity will be ready to open their purses to help – not just to set up conferences that help their tourism by filling empty hotels. The announcement also says that “There will also be the launch of new initiatives which will be of particular interest to news outlets.” This gets us to think that the approach taken by the UN is to entice news outlets rather then governments and businesses that could help. BUT THEN – THE UN MAIN OFFICE IN NEW YORK – THE PRESENT SECRETARIAT’S DEPARTMENT OF PUBLIC INFORMATION – CHASES AWAY THE MOST APPROPRIATE NEWS OUTLETS – THOSE INTERESTED IN SUSTAINABILITY – UNDER A UN WAY – UNDER UNSG BAN KI-MOON – OF DECIDING WHAT IS PRESS – THAT SEES IN SUSTAINABILITY AN ISSUE APPROPRIATE FOR NGOs AND NOT AS MEDIA. So, this sort of information disseminators can come with the NGOs but will not have access to what the appropriate professional agency would like to pass on to media. Oh Well – this is the UN to you! “Civil Society: Supporting Democracy in the 21st Century,” at the Community of Democracies. SECRETARY CLINTON: Well, I am delighted to be here with all of you. And I thank my friend, Foreign Minister Sikorski, for hosting us here in this absolutely magnificent setting, and for an excellent speech that so well summarized what the agenda for all of us who are members of the Community of Democracies should be. The idea of bringing together free nations to strengthen democratic norms and institutions began as a joint venture between one of Radek’s predecessors and one of mine: Minister Geremek and Madeleine Albright. And they were visionaries 10 years ago. And it was initially a joint American-Polish enterprise. And I cannot think of a better place for us to mark this occasion than right here in Krakow. Thank you, Madeleine, and thanks to the memory of Minister Geremek. SECRETARY CLINTON: I think you heard from Foreign Minister Sikorski some of the reasons why Poland is an example of what democracies can accomplish. After four decades of privation, stagnation, and fear under Communism, freedom dawned. And it was not only the personal freedoms that people were once again able to claim for their own, but Poland’s per capital GDP today is nine times what it was in 1990. And in the middle of a deep, global recession, the Polish economy has continued to expand. By any measure, Poland is stronger politically, as well. We all mourned with Poland in April when a plane crash claimed the lives of Poland’s president, the first lady, and many other national officials. It was one of the greatest single losses of leadership suffered by any country in modern history. But it is a tribute to Poland’s political evolution that, in the aftermath of that accident, the country’s institutions never faltered. And tomorrow polls will move forward with selecting a president through free and fair elections. Now, I would argue that this progress was neither accidental nor inevitable. It came about through a generation of work to improve governance, grow the private sector, and strengthen civil society. These three essential elements of a free nation — representative government, a well-functioning market, and civil society — work like three legs of a stool. They lift and support nations as they reach for higher standards of progress and prosperity. Now, I would be the first to admit that no democracy is perfect. In fact, our founders were smart enough to enshrine in our founding documents the idea that we had to keep moving toward a more perfect union. Because, after all, democracies rely on the wisdom and judgment of flawed human beings. But real democracies recognize the necessity of each side of that three-legged stool. And democracies that strengthen these three segments of society can deliver extraordinary results for their people. Today I would like to focus on one leg of that stool: civil society. Now, markets and politics usually receive more attention. But civil society is every bit as important. And it undergirds both democratic governance and broad-based prosperity. Poland actually is a case study in how a vibrant civil society can produce progress. The heroes of the solidarity movement, people like Geremek and Lech Walesa and Adam Michnik, and millions of others laid the foundation for the Poland we see today. They knew that the Polish people desired and deserved more from their country. And they transformed that knowledge into one of history’s greatest movements for positive change. Now, not every nation has a civil society movement on the scale of Solidarity. But most countries do have a collection of activists, organizations, congregations, writers, and reporters that work through peaceful means to encourage governments to do better, to do better by their own people. Not all of these organizations or individuals are equally effective, of course. And they do represent a broad range of opinions. And, having been both in an NGO and led NGOs and been in government, I know that it’s sometimes tough to deal with NGOs when you are in the government. But it doesn’t matter whether the goal is better laws or lower crime or cleaner air or social justice or consumer protection or entrepreneurship and innovation, societies move forward when the citizens that make up these groups are empowered to transform common interests into common actions that serve the common good. As we meet here on the eve of our American Fourth of July celebration, the day when we commemorate our independence, I want to say a word about why the issue of civil society is so important to Americans. Our independence was a product of our civil society. Our civil society was pre-political. And it was only through debate, discussion, and civic activism that the United States of America came into being. We were a people before we were a nation. And civil society not only helped create our nation, it helped sustain and power our nation into the future. It was representatives of civil society who were the first to recognize that the American colonies could not continue without democratic governance. And after we won our independence, it was activists who helped establish our democracy. And they quickly recognized that they were a part of a broader struggle for human rights, human dignity, human progress. Civil society has played an essential role in identifying and eradicating the injustices that have, throughout our history, separated our nation from the principles on which it was founded. It was civil society, after all, that gave us the abolitionists who fought the evils of slavery, the suffragettes who campaigned for women’s rights, the freedom marchers who demanded racial equality, the unions that championed the rights of labor, the conservationists who worked to protect our planet and climate. I did begin my professional life in civil society. The NGO I worked for, the Children’s Defense Fund, helped expand educational opportunities for poor children and children with disabilities, and tried to address the challenges faced by young people in prison. Now, I would be the first to say that our work did not transform our nation or remake our government overnight. But when that kind of activism is multiplied across an entire country through the work of hundreds, even thousands of NGOs, it does produce real and lasting positive change. So a commitment to strengthening civil society has been one of my constants throughout my public career as First Lady, Senator, and now Secretary of State. I was able to work with Slovakian NGOs that stood up to and ultimately helped bring down an authoritarian government. I have seen civil society groups in India bring the benefits of economic empowerment to the most marginalized women in that society. I have watched in wonder as a small group of women activists in South Africa begin with nothing and went on to build a community of 50,000 homes. President Obama shares this commitment. In his case, it led him to become a community organizer in Chicago. Both of us joined in the work of civil society because we believe that when citizens nudge leaders in the right direction, our country grows stronger. The greatness of the United States depends on our willingness to seek out and set right the areas where we fall short. For us and for every country, civil society is essential to political and economic progress. Even in the most challenging environments, civil society can help improve lives and empower citizens. In fact, I want to recognize two women activists who are with us today from Afghanistan and Iran. If Faiza Babakan and Afifa Azim would stand up, I would just like to thank you for your courage and your willingness to be here. SECRETARY CLINTON: Now, it may seem to some of us like a very nice, but perhaps not essential presence to have just one woman from each country be here. But I can speak from personal experience that, just as civil society is essential to democracy, women are essential to civil society. And these women speak for so many who have never had a chance to have their voices heard. So, along with well-functioning markets and responsible, accountable government, progress in the 21st century depends on the ability of individuals to coalesce around shared goals, and harness the power of their convictions. But when governments crack down on the right of citizens to work together, as they have throughout history, societies fall into stagnation and decay. North Korea, a country that cannot even feed its own people, has banned all civil society. In Cuba and Belarus, as Radek said, civil society operates under extreme pressure. The Government of Iran has turned its back on a rich tradition of civil society, perpetrating human rights abuses against many activists and ordinary citizens who just wanted the right to be heard. There is also a broader group of countries where the walls are closing in on civic organizations. Over the last 6 years, 50 governments have issued new restrictions against NGOs, and the list of countries where civil society faces resistance is growing longer. In Zimbabwe, the Democratic Republic of Congo, physical violence directed against individual activists has been used to intimidate and silence entire sectors of civil society. Last year, Ethiopia imposed a series of strict new rules on NGOs. Very few groups have been able to re-register under this new framework, particularly organizations working on sensitive issues like human rights. The Middle East and North Africa are home to a diverse collection of civil society groups. But too many governments in the region still resort to intimidation, questionable legal practices, restrictions on NGO registration, efforts to silence bloggers. I hope we will see progress on this issue, and especially in Egypt, where that country’s vibrant civil society has often been subjected to government pressure in the form of canceled conferences, harassing phone calls, frequent reminders that the government can close organizations down, even detention and long-term imprisonment and exile. In Central Asian countries, constitutions actually guarantee the right of association. But governments still place onerous restrictions on NGO activity, often through legislation or stringent registration requirements. Venezuela’s leaders have tried to silence independent voices that seek to hold that government accountable. In Russia, while we welcome President Medvedev’s statements in support of the rule of law, human rights activities and journalists have been targeted for assassination, and virtually none of these crimes have been solved. And we continue to engage on civil society issues with China, where writer Liu Xiaobo is serving an 11-year prison sentence because he co-authored a document calling for respect for human rights and democratic reform. Too many governments are seeing civic activists as opponents, rather than partners. And as democracies, we must recognize that this trend is taking place against a broader backdrop. In the 20th century, crackdowns against civil society frequently occurred under the guise of ideology. Since the demise of Communism, most crackdowns seem to be motivated instead by sheer power politics. But behind these actions, there is an idea, an alternative conception of how societies should be organized. And it is an idea that democracies must challenge. It is a belief that people are subservient to their government, rather than government being subservient to their people. Now, this idea does not necessarily preclude citizens from forming groups that help their communities or promote their culture, or even support political causes. But it requires these private organizations to seek the state’s approval, and to serve the states and the states’ leaderships’ larger agenda. Think for a moment about the civil society activists around the world who have recently been harassed, censored, cut off from funding, arrested, prosecuted, even killed. Why did they provoke such persecution? Some weren’t engaged in political work at all. Some were not trying to change how their countries were governed. Most were simply getting help to people in need, like the Burmese activists imprisoned for organizing relief for victims of Cyclone Nargis. Some of them were exposing problems like corruption that their own governments claim they want to root out. Their offense was not just what they did, but the fact that they did it independently of their government. They were out doing what we would call good deeds, but doing them without permission. That refusal to allow people the chance to organize in support of a cause larger than themselves, but separate from the state, represents an assault on one of our fundamental democratic values. The idea of pluralism is integral to our understanding of what it means to be a democracy. Democracies recognize that no one entity — no state, no political party, no leader — will ever have all the answers to the challenges we face. And, depending on their circumstances and traditions, people need the latitude to work toward and select their own solutions. Our democracies do not and should not look the same. Governments by the people, for the people, and of the people will look like the people they represent. But we all recognize the reality and importance of these differences. Pluralism flows from these differences. And because crackdowns on NGOs are a direct threat to pluralism, they also endanger democracy. More than 60 years ago, Winston Churchill came to the United States to warn the world’s democracies of an iron curtain descending across Europe. Today, thankfully, thanks to some of you in this room, that iron curtain has fallen. But we must be wary of the steel vise in which many governments around the world are slowly crushing civil society and the human spirit. Today, meeting together as a community of democracies, it is our responsibility to address this crisis. Some of the countries engaging in these behaviors still claim to be democracies because they have elections. But, as I have said before, democracy requires far more than an election. It has to be a 365-day-a-year commitment, by government and citizens alike, to live up to the fundamental values of democracy, and accept the responsibilities of self government. Democracies don’t fear their own people. They recognize that citizens must be free to come together to advocate and agitate, to remind those entrusted with governance that they derive their authority from the governed. Restrictions on these rights only demonstrate the fear of illegitimate rulers, the cowardice of those who deny their citizens the protections they deserve. An attack on civic activism and civil society is an attack on democracy. Now, sometimes I think that the leaders who are engaging in these actions truly believe they are acting in the best interests of their country. But they begin to inflate their own political interests, the interests of that country, and they begin to believe that they must stay in office by any means necessary, because only they can protect their country from all manner of danger. Part of what it requires to be a true democracy is to understand that political power must be passed on, and that despite the intensity of elections, once the elections are over, whoever is elected fairly and freely must then try to unify the country, despite the political division. I ran a very hard race against President Obama. I tried with all my might to beat him. I was not successful. And when he won, much to my surprise, he asked me to join his Administration to serve as Secretary of State. Well, in many countries, I learned as I began traveling, that was a matter of great curiosity. How could I work with someone whom I had tried to deprive of the office that he currently holds? But the answer for both President Obama and I was very simple. We both love our country. Politics is an important part of the lifeblood of a democracy. But governing, changing people’s lives for the better, is the purpose one runs for office. In the Community of Democracies, we have to begin asking the hard questions, whether countries that follow the example of authoritarian states and participate in this assault on civil society can truly call themselves democracies. And to address this challenge, civil society groups and democratic governments must come together around some common goals. The Community of Democracies is already bringing together governments and civil society organizations, some of whom are represented here. And it is well suited to lead these efforts. I know that the Community of Democracies working group on enabling and protecting civil society is already working to turn this vision into a reality. The United States pledges to work with this community to develop initiatives that support civil society and strengthen governments committed to democracy. With the leadership and support of countries like Lithuania, Poland, Canada, and Mongolia, I believe that the Community’s 20th anniversary could be a celebration of the expanding strength of civil society, and the true institutionalization of the habits of the heart that undergird democracy. To make that happen, our joint efforts, I believe, should include at least four elements. First, the Community of Democracies should work to establish, as Radek recommended, an objective, independent mechanism for monitoring repressive measures against NGOs. Second, the United Nations Human Rights Council needs to do more to protect civil society. Freedom of association is the only freedom defined in the United Nations declaration of human rights that does not enjoy specific attention from the UN human rights machinery. That must change. Third, we will be working with regional and other organizations, such as the OAS, the EU, the OIC, the African Union, the Arab League, others, to do more to defend the freedom of association. Many of these groups are already committed to upholding democratic principles on paper. But we need to make sure words are matched by actions. And, fourth, we should coordinate our diplomatic pressure. I know that the Community of Democracies working group is focused on developing a rapid response mechanism to address situations where freedom of association comes under attack. Well, that can’t happen soon enough. When NGOs come under threat, we should provide protection where we can, and amplify the voices of activists by meeting with them publicly at home and abroad, and citing their work in what we say and do. We can also provide technical training that will help activists make use of new technologies such as social networks. When possible, we should also work together to provide deserving organizations with financial support for their efforts. Now, there are some misconceptions around this issue, and I would like to address it. In the United States, as in many other democracies, it is legal and acceptable for private organizations to raise money abroad and receive grants from foreign governments, so long as the activities do not involve specifically banned sources, such as terrorist groups. Civic organizations in our country do not need the approval of the United States Government to receive funds from overseas. And foreign NGOs are active inside the United States. We welcome these groups in the belief that they make our nation stronger and deepen relationships between America and the rest of the world. And it is in that same spirit that the United States provides funding to foreign civil society organizations that are engaged in important work in their own countries. And we will continue this practice, and we would like to do more of it in partnership with other democracies. As part of that commitment, today I am announcing the creation of a new fund to support the work of embattled NGOs. We hope this fund will be used to provide legal representation, communication technology such as cell phone and Internet access, and other forms of quick support to NGOs that are under siege. The United States will be contributing $2 million to this effort, and we welcome participation and contribution from like-minded countries, as well as private, not-for-profit organizations. The persecution of civil society activists and organizations, whether they are fighting for justice and law, or clean and open government, or public health, or a safe environment, or honest elections, it’s not just an attack against people we admire, it’s an attack against our own fundamental beliefs. So when we defend these great people, we are defending an idea that has been and will remain essential to the success of every democracy. So the stakes are high for us, not just them. For the United States, supporting civil society groups is a critical part of our work to advance democracy. But it’s not the only part. Our national security strategy reaffirms that democratic values are a cornerstone of our foreign policy. Over time, as President Obama has said, America’s values have been our best national security asset. I emphasized this point in December and January, when I delivered speeches on human rights and Internet freedom. And it is a guiding principle in every meeting I hold and every country I visit. My current trip is a good example. I have just come from Ukraine, where I had the opportunity not only to meet with the foreign minister and the president, but with a wonderful group of young, bright Ukrainian students, where I discussed the importance of media freedom, the importance of freedom of assembly, and of human rights. Tonight I will leave for Azerbaijan, where I will meet with youth activists to discuss Internet freedom, and to raise the issue of the two imprisoned bloggers, and to discuss civil liberties. From there I will go to Armenia and Georgia, where I will be similarly raising these issues, and sitting down with leaders from women’s groups and other NGOs. This is what we all have to do, day in and day out around the world. So, let me return to that three-legged stool. Civil society is important for its own sake. But it also helps prop up and stabilize the other legs of the stool, governments and markets. Without the work of civic activists and pluralistic political discourse, governments grow brittle and may even topple. And without consumer advocates, unions, and social organizations that look out for the needs of societies’ weakest members, markets can run wild and fail to generate broad-based prosperity. We see all three legs of the stool as vital to progress in the 21st century. So we will continue raising democracy and human rights issues at the highest levels in our contacts with foreign governments, and we will continue promoting economic openness and competition as a means of spreading broad-based prosperity and shoring up representative governments who know they have to deliver results for democracy. So, ultimately, our work on these issues is about the type of future we want to leave to our children and grandchildren. And anyone who doubts this should look at Poland. The world we live in is more open, more secure, and more prosperous because of individuals like Lech Walesa, Adam Michnik, others who worked through the solidarity movement to improve conditions in their own country, and who stand for freedom and democracy. I think often about the role of journalists. Journalists are under tremendous pressure. But a journalist like Jerse Tarovich, a son of Krakow, asked tough questions that challenged Poland to do better. And Pope John Paul II, who, as Stalin would have noted, had no battalions, marshaled moral authority that was as strong as any army. We all have inherited that legacy of courage. It is now up to us. Every Fourth of July Americans affirm their belief that all human beings are created equal, that we are endowed by our creator with unalienable rights: life, liberty, and the pursuit of happiness. Today, as a community of democracies, let us make it our mission to secure those rights. We owe it to our forebears, and we owe it to future generations to continue the fight for these ideals. Rhonda Hauben, on Global Times (published in Beijing) explains how the UN is still technically at war with North Korea and that June 25, 2010 we will have the 60th anniversary of that war. Is the UN trying to end that war, or just de-nuclearize North Korea and leave the US nuclear Umbrella in place in South Korea? UPDATED – Do we have a situation that five-of-the-six just decide to out-wait North Korea? Six-party talks up to North: Bosworth. U.S. special envoy to North Korea Stephen Bosworth said Saturday in Tokyo he hopes to see “fairly soon” the resumption of the stalled six-party talks on Pyongyang’s nuclear programs, but added whether that is realized depends on the North. “Five of the six parties are prepared to move very quickly. And we would hope that the sixth, that is to say the DPRK, will also decide to move ahead very quickly,” Bosworth told reporters, referring to North Korea by its official name of the Democratic People’s Republic of Korea. This June 25 marks the 60th anniversary of the beginning of the Korean War in 1950. Only an armistice and a temporary agreement, not a peace treaty, are in place to help prevent a renewed outbreak of hostilities. A four-person delegation from the office of the UN Secretary-General which included B. Lynn Pascoe and Kim Won-soo recently returned to the UN after their visit to North Korea, between February 9 and 12, 2010. This was the first delegation to establish official relations between North Korea and the UN Secretariat since Maurice Strong acted as an envoy of Kofi Annan to North Korea in 2004. At the press conference at the UN, held on the return of the UN delegation, only minimal information was provided about the issues that North Korea raised. In his brief presentation, Pascoe, Under-Secretary-General for Political Affairs, mentioned some of the issues discussed, including a statement that there had been back-and-forth talks about a peace treaty. Pascoe said, however, that he was not going to get into details. A little later in the press conference, a question was asked about what issues North Korea had brought up. Pascoe’s response included that North Korea did talk about a peace treaty and why they saw it as an important way to build trust. Much of the press conference, focused on questions about North Korea returning to the Six-Party Talks. A purpose of the UN secretariat trip was to convey messages from other parties of the Six-Party Talks to North Korea, and to convey the Secretary- General’s view that talks need to begin without preconditions. At the end of WWII, Korea was artificially divided into two separate entities: the Republic of Korea in the south, or South Korea, and the Democratic People’s Republic of Korea in the north, or North Korea. This division was initially regarded as temporary. Instead, it was maintained and reinforced by various actions of the UN. Then during the Korean War, the United Nations flag and name were used. North Korea sees the need for a peace treaty to help calm the tension that exists because currently there is only the temporary armistice agreement. North Korea proposes that three parties to the armistice, the US (for the UN command), North Korea, and China (the Chinese People’s Volunteer Army) to negotiate for the peace treaty. It also proposes to include South Korea. This is proposed as the means to build confidence among these four parties so as to be able to return to the Six- Party Talks with experience to make possible reaching an agreement on the denuclearization of the Korean Peninsula. The actual denuclearization will be a task that will involve both North Korea giving up its nuclear weapon capability and South Korea giving up the protection that the US offers it by including it under the US’s nuclear umbrella. The press conference at the UN, however, didn’t discuss the issue of the peace treaty or the need to consider the denuclearization of both nations on the Korean Peninsula. Instead, the majority of questions concerned whether North Korea would return to the Six-Party Talks. North Korea has criticized the talks as not helpful to solving the disputes that continue to breed hostility in the region. Recent talks have focused on removing the nuclear capability of North Korea, rather than similarly considering North Korea’s claim that it needs its nuclear capability as a security measure as long as hostile actions continue by other members of the Six-Party process. In previous talks between North Korea and the US, one of the negotiators explained the most difficult part of the negotiations was determining how to phrase the issue of the talks so that it recognized the interests of different parties to the controversy. He said that North Korea made the reasonable request that the issue be phrased in a way satisfactory to both North Korea and the US. One would expect a similar problem will need to be solved to facilitate discussion among the parties to the Six-Party Talks, or to facilitate negotiations toward a peace treaty to end the Korean War. After the press conference, Kim Won-soo, Deputy Chef de Cabinet of the UN, said the dispute over how to get back to negotiations could be seen as a difference over what sequencing was acceptable. What order of actions would the parties agree to with regard to discussing a peace treaty, ending the UN sanctions, or returning to the Six-Party Talks process, could be considered an issue to be discussed, rather than phrasing the problem in terms favorable to one side or the other. This is the basis for further discussion and negotiation among North Korea and the other countries. The UN is technically still at war with North Korea. These current developments raise the question of whether Ban Ki-moon is willing to use the good offices of his position as Secretary-General to offer what help he can to facilitate a peace treaty to end the Korean War. Even this first step of an official visit by the four-member UN Secretariat delegation and the mere mention that the North Korea referred to the desire for a peace treaty can be seen as a step forward. The Secretary-General is endeavoring to help solve the stalemate among the parties regarding the continuing tension on the Korean Peninsula. Global Times appears in English and originates from Beijing. Mongolia is an unassuming country, sandwiched in between Russia and China and has sworn to stay nuclear free and made known it is no danger to anyone. This is Mongolia’s highest contribution to its region and it could be an example to North Korea when that State decides to attempt change. Mongolia can smooth the way to the six parties talks. Mongolia is the 19th largest and the most sparsely populated independent country in the world, with a population of about three million people. It is also the world’s second-largest landlocked country after Kazakhstan. The country contains very little arable land, as much of its area is covered by steppes, with mountains to the north and west, and the Gobi Desert to the south. Approximately 30% of the population are nomadic or semi-nomadic. The predominant religion in Mongolia is Tibetan Buddhism, and the majority of the state’s citizens are of the Mongol ethnicity, though Kazakhs, Tuvans, and other minorities also live in the country, especially in the west. About 20% of the population live on less than US$1.25 per day. Global warming has had a serious impact on Mongolia and its land became even drier with very active further desertification; but Mongolia is rich in minerals and exporting minerals such as Coal, Uranium, Lithium, Copper, Molybdenum, Tin, Tungsten, Gold and oil provide it with cash flow. Companies and Financing from China, Japan, South Korea, Germany, Russia, Canada are active in Mongolia. In Mongolia during the 1920s, approximately one third of the male population were monks. By the beginning of the 20th century about 750 monasteries were functioning in Mongolia. The Stalinist purges in Mongolia beginning in 1937, affected the Republic as it left more than 30,000 people dead. Japanese imperialism became even more alarming after the invasion of neighboring Manchuria in 1931. The Soviet threat of seizing parts of Inner Mongolia induced China to recognize Outer Mongolia’s independence. So – the mutual distrust between China and the Soviets allowed for an independent Mongolia. The introduction of perestroika and glasnost in the USSR by Mikhail Gorbachev strongly influenced Mongolian politics leading to the peaceful Democratic Revolution, and the introduction of a multi-party system and market economy. A new constitution was introduced in 1992, and the “People’s Republic” was dropped from the country’s name. The transition to market economy was often rocky, the early 1990s saw high inflation and food shortages. The first election wins for non-communist parties came in 1993 (presidential elections) and 1996 (parliamentary elections). So, Mongolia, an ex-communist country moved to a market economy. The evolution of Mongolia is now of special interest to those that would like to see movement in efforts to solve the Korean peninsula schism. Mongolia could be an example for North Korea if it becomes interested in dropping its attachment to the former Soviet way of managing a country – and that is what brought a high level Mongolian group to The Korea Society in New York City, for breakfast, today, February 23, 2010. The speaker was H.E. Damdin Tsogtbaatar, State Secretary of the Ministry of Foreign Affairs and Trade. Next to him sat the Mongolian Permanent Representative to the UN H.E. Enkhtsetseg Ochir. Also present was the Deputy Permanent Representative Sodnom Gankhuyag. The presentation started with the geopolitics and the paradox that both neighbors – China and Russia – are conservative cultures but when changing they are revolutionary. Being enclosed in that sandwich, the Mongolian Foreign Policy has to be an open policy and with both neighbors nuclear – it had to mean for Mongolia that it can only be free of nuclear weapons. From here he looked at the other two countries that started out in similar conditions like Mongolia – Cuba and North Korea. While Mongolia developed a democracy romanticism – this was not the case with the other two. In effect North Korea looked down at Mongolia and closed its embassy in 1999 and used the excuse that they do so because of economy conditions. Mongolia watched the South Korean Sunshine Policy towards North Korea and as regional Mongolian expats live in South Korea, and Mongolia’s interest to help stabilize the region in its own interest, they started to get more and more interested in what goes on on the Korean Peninsula and in Japan. For one thing – North Korea was interested in Petroleum. North Korea is isolated by its own choice – but someone must get interested in North Korea. In fact in the 1970’s North Korea was ahead of South Korea – more developed – but se now. During the Korean War – only the Russian and Mongolian Ambassadors were left in North Korea. Mongolia also helped by taking in the N. Korean orphans and returned them when hostilities stopped. Mongolia does not think that the North Koreans are totally irrational, even though he told of some instances that you real wonder – one such was the idea of developing an ostrich farm in N. Korea. Mongolia initiated cultural exchanges that include also Japanese groups. The idea is that Mongolia can try to prepare the ground on which the meetings of the six parties could be restarted. Mongolia does not believe that sanctions will work – they only punish the people who then clam up and there is no progress. That is when I noted that the two Mongolian men in the room both had purple ties, and I wandered if this is an effort not to look blue or red? Further – Acquiring nuclear technology is not the end – he said – see Kazakhstan and the Ukraine – they had nuclear and gave them up – eventually comes a government and changes of a sudden are possible. North Korea – the transition of power is supposed to happen in 2012, but considering the health of the leader it could happen earlier. About money reform -That had an impact only on those that had money. It affected people in the cities – not the countryside. John Delury, an Associate Director at the Asia Society Center on US-China Relations, said that when he spoke to North Koreans when asked why they do not evolve according to the China model, they answered that they are on the China track. See, China first got nuclear, then only formalized relations with the US after they became nuclear. Only then kicked in stage three that was economical. Mongolia was able to put at one table North Korea and Japan but to bring together both Koreas is more difficult. First, with President Lee the Sunshine policy was ended, and a strong anti-North Korean approach was established. The feeling is that the South Koreans, like any democracy, became tired to wait. The situation is now such that both Koreas say – we know what to do – thanks – no – thanks. Mongolia does no believe in treaties and going to court like lawyers when you deal with nuclear weapons. One can push the button and it is over – but then he said earlier that the belief is there that eventually people are rational – so what is it? Do we must be careful to avoid such situation by stopping a country like Iran from getting nuclear, in order to avoid later dilemmas? Anyway – Iran was not the Issue here but North Korea – so let us say that Mongolia can nevertheless provide an example to North Korea, even if not a model – that changing from threat to agreement could help economically. 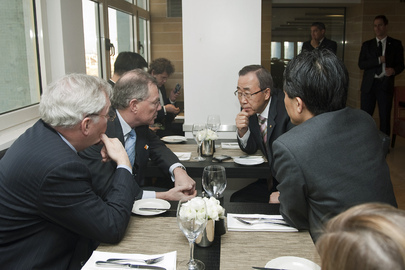 In effect the day before, the Mongolian envoy had an hour-long meeting with UNSG Ban Ki-moon. Matthew Lee from ICP about Mr. Ban Ki-moon’s UN when it comes to North Korea – seemingly all good rules of the UN are simply pushed aside – but will it lead to the closing of the gap between the two Koreas? In North Korea, UN Did Not Raise Press Freedom, Hires Staff from Gov’t Lists, UN’s “Comparative Advantage”? UNITED NATIONS, February 16 — How badly does the UN under Secretary General Ban Ki-moon want to be relevant in North Korea? His senior advisor Kim Won-soo and his Political Affairs chief Lynn Pascoe traveled to Pyongyang and did not even raise the issue of press freedom. In response to questions from Inner City Press upon their return, Mr. Kim said that “things are moving forward,” while Mr. Pascoe claimed that the UN Development Program “hires its own employees now rather then take them through the government.” Video here, from Minute 12:52. But Mr. Kim later clarified that UNDP staff will still be chosen from lists forwarded by the Kim Jong-Il government, only there will be “multiple” candidates. He acknowledged that the UN still has problems with “access and visas” but said there are at the “local level.” In the Democratic People’s Republic of Korea, it all comes from the top: Kim Jong-Il, with whom the two did not even meet. Earlier on Tuesday, the Committee to Protect Journalists has named North Korea as the most censored country on earth, and had called on Ban Ki-moon to speak out more forcefully on press freedom. Inner City Press asked Pascoe and Kim Won-soo about this. Pascoe said they hadn’t raised press freedom “per se.” Kim Won-soo, who was asked twice about press freedom, did not answer the question. Most questions were about whether North Korea will rejoin the Six Party talks about its nuclear programs. That is up to the Six Parties, Pascoe and Kim Won-soo repeatedly said. The UN is a go between. For example, Pascoe said that his staffer Aleksandr Ilitchev is “going to Moscow tomorrow,” after along with Ban staff Lee Sang-Hwa being on the trip, presumably to brief on the Six Party talks. On UNDP, Mr. Kim told Inner City Press, “You are right, UNDP’s program has been suspended for two and a half years. The Resident Coordinator [moved back] three months ago.” According to Mr. Kim, he’s had to focus on renovating the UN office and residence. “The building was empty, so we couldn’t see any safe there,” he said, referring to the safe in which counterfeit dollars were found, which UNDP never reported until a whistleblower raised it. That whistleblower was something of an elephant in the briefing room on Tuesday, with Mr. Kim Won-soo assuring that all UN programs in North Korea will now be scrutinized. Ironically he mentioned a “geo-spacial” mapping project which was one of those that got the UNDP program into trouble two and a half years ago. Background: Five months into Ban’s tenure atop the UN, in May 2007, he was angered by the leak to Inner City Press of a internal memo (“Korea Peninsula UN Policy and Strategy Submission to the Policy Committee”) proposing that the UN use its “comparative advantage” to make itself relevant on the North Korea issue. Now, the competitive advantage is being used. Back in 2007, Ban had been forced to order an audit of the UN Development Program’s North Korea practices, including funding project which it could neither visit nor oversee. UNDP’s program had been suspended. Recently, despite the continuing nuclear standoff and renewed firing across the border, as well as lack of movement on human rights, UNDP re-started its North Korea program. And now the Ban administration’s “comparative advantage” is back. UN’s Ban, Mr. Kim and Lynn Pascoe, press freedom not in the picture. After the February 16 briefing, Mr. Kim Won-soo stayed and answered further questions. He said there are 39 international staff from six UN agencies currently in North Korea. He said the programs there spend approximately $45 million a year; he pointed out that’s $2 a person. UNDP will come up with a five year plan by “sometime in March,” then seek approval from the UNDP board. Things are, he said, moving in the right direction. And on those who seek to leave the country? And on press freedom? Watch this site. Footnote: this was Kim Won-soo’s first on the record briefing at the UN, following requests made based on the JoongAng Ilbo’s on the record quote about the trip attributed to Mr. Kim. Later, also on the record, Ban’s Associate Spokesperson Choi Soung-ah told Inner City Press that Mr. Kim “did not give an exclusive to JoongAng Ilbo.” But the UN never sought a retraction. Mr. Kim appeared on Tuesday, and Inner City Press asked him to return for another briefing about the Ban administration’s wider work. We’ll see. Climate Change Adaptation: It’s about Water! Water is central to the world’s development challenges. Whether it is food security, poverty reduction, economic growth, human health—water is the nexus. Climate change is the spoiler. No matter how successful mitigation efforts might be, people will experience the impacts of climate change through water. The Global Water Partnership is participating in ‘Water Day’ at the climate change negotiations in Barcelona. GWP Executive Secretary Dr Ania Grobicki will be the lead speaker on water and transboundary issues on Tuesday, November 3. The venue is the Fira Congress Hotel, opposite the conference centre. The opening session starts at 9 am and lunch will be provided. Recently, the GWP’s Technical Committee released its 14th Background Paper: “Water Management, Water Security and Climate Change Adaptation.” It argues that investments in water are investments in adaptation. The paper can be downloaded on www.gwpforum.org or ordered free at gwp@gwpforum.org. Climate Change: How can we Adapt? – a one-pager about GWP’s key messages on this subject – is available here: www.gwpforum.org/gwp/library/GWP_Briefingnote_climatechange.pdf. GWP has been accepted as an Inter-Governmental Organisation with Observer Status at COP 15 in Copenhagen in December and has submitted an article to the delegate publication. But more information on that will follow later. More resources about climate change and water and more information on GWP’s involvement in the global dialogue on climate change is available on this page: www.gwpforum.org/servlet/PSP?iNodeID=205&itemId=442. A water secure world – the mission of the Global Water Partnership is to support the sustainable development and management of water resources at all levels. Bill McKibben writes of the dawning of climate action day that started in New Zealand then moved via Australia to Thailand, Mongolia, and the Indian Sub-Continent. I can hardly believe my eyes. 16 hours ago, citizens in New Zealand gathered before dawn next to a wind turbine on a mountaintop. As local elders said prayers to bless the global event, banners and signs were held high to to greet the planet’s first rays of sunlight on this most incredible of days. As the sun continues across the planet we’ve been receiving photos and video of rallies in Ethiopia, bike rides in Wellington, SCUBA divers in Australia, organizers planting 350 trees in Thailand, hundreds of students marching in India and Nepal and Mongolia. And we’re getting reports from 350.org offices around the world that the phones are ringing off the hook with calls from the media who want to cover the story. The day is just beginning and already it’s larger, more powerful, and so much more beautiful than I ever could have imagined. I’ve been a writer my entire life and yet words truly cannot describe what you have accomplished already. To truly grasp today, please stay tuned to our website as more and more photos come in from across the planet, and especially our evolving photo slideshow. And the best news of all? The day has just begun! P.S. Have a photo to contribute? Just send a decent-quality picture to photos@350.organd make the subject “City, Country” and make sure that the body of the e-mail contains a description of the photo, any necessary photographer credits, and any other information you think we’ll need. So many thanks. An UPDATE – Dr. Perkins, leadership, The Explorers Club New York, The Lowell Thomas Awards Dinner 2009 and “Mountain Stories” October 15 and 17 events. We had the following as a posting on our future events button. Now we update after the events. Dr. Perkins, a student of leadership, to speak October 15th at the Explorers Club annual Dinner. Dr. Perkins is a graduate of the United States Naval Academy at Annapolis, served as a Marine infantry officer in Vietnam and subsequently received an MBA from Harvard University, and a Ph.D. in psychology at the University of Michigan. Dr. Perkins has spent his lifetime evaluating and analyzing leadership and teamwork of successful and doomed expeditions, first as a front line military leader and subsequently in the field and as faculty at our nation’s top universities. Dr. Perkins’ passion to experience and understand risk has taken him to disparate places including Antarctica, where he retraced the footsteps of famed explorer, Ernest Shackleton; and to Australia, where he sailed the Midnight Rambler, winning the challenging Sydney to Hobart Race, a 628 nautical mile race — often called “the Everest” of offshore racing – using a Volvo 60 racing boat. Dr. Perkins has written extensively on leadership and organizational effectiveness all in the context of risk assessment and optimization. I was intrigued by the interest in risk as described in the Explorers Club info material. Indeed, now I can report that both events did indeed stand in the shadow of the RISK idea – but please mind – this was not in the sense of getting involved in adventures for the sake of adventure, but rather the cold assessment of risk, and the intelligent process of learning how to get out from under dangerous conditions. You get to risks at the edge and might look at the brink – said one speaker. The speakers were all old style explorers and by nature of this concept – risk takers. Those that were honored at the dinner were obviously members of the older generation, but at the Saturday “Mountain Stories” event we saw also younger people – so there is still a future for those that want to allow for risk taking. Now the problem is to find places to explore – but I learned that there is no shortage of such possibilities. Climbing new peaks in areas that were less accessible in the past is just one possibility, but going back to mountain peaks that have been explored many times in the past, but using new equipment, it is possible to open up new roots and even get a minor peak called by your name. Going in the foots of Shackleton in the Antarctica, Dr. Perkins said that the good news was that we have been there before and we know how to do it. What the explorer must do is to look calmly at the situation and step up to the risk worth taking. The challenge is to find innovative solutions to problems under least favorable conditions. Yvon Choinard, a Patagonian man, climed mountains on every continent. Long time ago, he looked for the true source of the Nile at Mt. Stanley in Uganda. He said that he never goes on an adventure trip – it just happens when you take small risks on the way. Richard Wilson, told about racing a boat for 120 days and 28,000 miles, from Port la Foret, Brittany. The Saturday event was set up to honor further six outstanding explorers and mountain climbers. I was there for three of the six. The last presenter was Jennifer Loew-Anker – born in Montana to the outdoors from birth – she sounded like a proof that genetics, or call it upbringing – have something to do with it. When you ride a horse at two years of age, and horse-riding is in effect more dangerous then mountain climbing … you get my point. Jennifer is an artist with wildlife her major topic. She presented to us her book “Forget Me Not” about her first husband – her childhood friend from Montana – Alex Lowe, who died in 1999, in an avalanche on the Himalayan mountain Shishapangma. Alex was considered one of the greatest modern climbers. Jennifer showed us a movie about their lives – she herself also a great climber. After 18 years of marriage, she was left with three children. Eventually, two years later she remarried another climber who worked with Alex. Jennifer told us about climbing done in the Pinar del Rio region of Cuba, and of philanthropic work she does now with the Alex foundation. They built a climbing wall in Mongolia and established a school for sherpas when they realized that the sherpas actually never learned to take care for themselves, and the number of casualties among the sherpas is so much higher then among the foreign climbers. The other two – actually three speakers – were the pair Freddie Wilkenson & Janet Bergman, and Kevin Mahoney. All of them from the Mt. Washington, New Hampshire, Mountain Climber community. All of them connected to the Dartmouth Club and to “Mountain Hardware,” and from their base they work as guides and climbers all over the world. Kevin Mahoney sees his job as a “mitigator of risk – so people discover their own worth.” He defined himself as a winter person – he climbs ice. He said that skying has many more accidents then ice climbing. Freddie Wilkinson and Janet Bergman are young people from Kevin Mahoney’s group. They gave us a run down on today’s ice climbing – mentioning that 95% of climbing is done in a handful of peaks in the Himalayas. They described themselves as a great team as Freddie looks for opportunities and Janet for barriers – this when trying to identify new targets for climbing or new ways of climbing in areas that have been covered earlier. Now I come to the real reason why I looked at these two fascinating programs at the Explorers Club – this because of an obsession I developed at the UN when I realized that the New York based Explorers Club is an NGO affiliated to the UN, but not part of the environmental NGOs active at the UN. I realized at the time that the Club was dominated by people that would rather shoot an elephant and turn it over to a taxidermist so it be a trophy for them. Could they find the last dinosaur, they would have stuffed him also. That might have been right for the days of President Theodore Roosevelt, but I thought that today you ought not love the outdoors in order to kill them. Also climate change is a rather important issue and I saw tremendous potential here to get the Explorers involved. Eventually I approached a young new President of the Club, we met but nothing happened. Now, at the Saturday event I spoke with some of those that were honored at the event. These were young people and clearly not of the riffle kind, but still did not find a feel for activism present on our kind of issues. Nevertheless, I found hope for change. When I asked Kevin Mahoney if he found signs of climate change in Nepal, he started to tell me about the farmer who complained that he has to go higher uphill with the sheep he owns, because there is no grass for them as there is a lack of water. So he goes up higher to areas that used to be covered snow! This clearly gave me the opening to talk a little about the melting glaciers, and I found real interest among the young climbers. So there may be hope that someday the Explorers might indeed become Environmentalists as well – provided by that time there will still be left some environment to explore. Just think of the snow caps of Kenya and Tanzania and my statement above might not sound absurd at all. Is this a different meaning for RISK? September 18, 2009 – Mongolian Grasslands Music comes to New York via Beijing. Highly Recommended. Hanggai, composed of young musicians from Beijing and the Chinese province of Inner Mongolia, is at the forefront of a modern Mongolian folk revival in the heart of Beijing. The musicians are pioneers of “Chinagrass” – contemporary Chinese folk music (often performed by or influenced by Chinese minorities) that reclaims roots music from the grasslands. Mixing khoomei (throat singing – a fascinating vocal technique in which a single musician produces two notes simultaneously), morin khuur (horsehair fiddle) and tobshuur (2-stringed lute) with guitar, bass and percussion, the group draws on a repertoire that all but disappeared during China’s recent turbulent past. UNSG Ban Ki-moon goes this week to China (Beijing and Xian) and Mongolia. You bet – it is about . . . climate change. Climate change, which Secretary-General Ban Ki-moon has called “the defining challenge of our era,” will feature prominently on the United Nations chief’s visits later this week to China and Mongolia, his spokesperson said today. Earlier this year, Mr. Ban called on China – as well as the United States, India and the European Union – to show “global leadership of the highest order” in tackling the issue, particularly in the run-up to the crucial climate change negotiations scheduled for December in Copenhagen to draw up a new agreement to succeed the Kyoto Protocol on reducing greenhouse gas emissions. “During his working visit to China, he will pursue his dialogue with the Chinese leadership on climate change and other global issues,” UN spokesperson Marie Okabe told reporters. The Secretary-General is scheduled to meet on Friday with President Hu Jintao, Premier Wen Jiabao, Foreign Minister Yang Jiechi and other Chinese officials in Beijing and later, on Saturday, in Xi’an. While in China, he will participate in a number of climate change-related programmes, including a “Green Light” event focusing on energy efficient technologies and the extensive production and use of energy saving lamps in the world’s most populous nation. Mr. Ban then travels on Sunday to Mongolia, where he will address the challenges of climate change and adaptation with an emphasis on the special needs of landlocked countries, said Ms. Okabe. Mongolia is one of 30 landlocked developing countries, which face a number of constraints to their economic development, including lack of territorial access to the sea, remoteness and isolation from world markets and high transit costs. Mr. Ban is scheduled to meet with President Elbegdorj Tsakhia, Prime Minister Bayar Sanj and Foreign Minister Sukhbaatar Batbold. Also during his visit, the Secretary-General will spend time in a traditional Mongolian herder community that is faced with water shortages and desertification. Herding and agriculture have traditionally been the backbone of the country’s economic activity, according to the UN Office of the High Representative for Least Developed Countries, Landlocked Developing Countries and Small Island Developing States (UN-OHRLLS). The world’s largest economies have “clearly ignored” the findings of the Nobel Peace Prize-winning United Nations scientific body that evaluates climate change when formulating their recent proposals on slashing greenhouse gases, a top official said today. It was a “big step” for leaders of over one dozen developed nations attending the Major Economies Forum (MEF) – including the Group of Eight (G8) nations and others – on 9 July meeting in L’Aquila, Italy, to recognize that the global average temperature should not increase by more than 2 degrees centigrade, Rajendra Pachauri, Chair of the UN Intergovernmental Panel on Climate Change (IPCC), told reporters in New York today. But they have disregarded the IPCC’s findings that emissions will have to reach their pinnacle in 2015 and rapidly decline thereafter, he said. “If the G8 leaders agreed on this 2-degree increase as being the limit that could be accepted, then I think they should have also accepted the attendant requirement of global emissions peaking by 2015,” Mr. Pachauri said. At the very least, he added, the countries should have “categorically” committed to cuts by 2020, the date agreed to at the landmark 2007 UN climate change conference in Bali, Indonesia. The official also pointed out that despite committing to “deep cuts” in emissions, the leaders of the MEF nations have yet to discuss the substance of the reductions. “The science is getting clear,” Mr. Pachauri underlined. “The gaps in our knowledge are certainly filling up,” he said, stressing the need for “the global community to take action” and ensure that this December’s climate change conference in Copenhagen, Denmark, ends with countries wrapping up negotiations on a strong successor pact to the Kyoto Protocol, whose first commitment period ends in 2012. An IPCC meeting in Venice, Italy, last week drew 200 climate change experts from all over the world to discuss the focus of the body’s next assessment report – considered to be the most comprehensive study globally on global warming – due to be released in 2014. To support countries in their bid to conclude a successor pact in December to the Kyoto Protocol, whose first commitment period ends in 2012, the Secretary-General is convening a high-level summit – expected to be the largest climate change gathering this year – in New York on 22 September. In an announcement made in Tokyo, Starting November 17 in Dharmsala, and then continuing later this months in Delhi, following discussions with the Chinese Government, The Dalai Lama and Envoys of the Tibetan communities and the international support groups will dicuss how to develop an approach aimed at “realistic autonomy from China.” He wants true democracy and not the “Very dirty, corrupt capitalism” as it emerged in China. The people of Tibet should and will decide negotiation strategy with China later this month through a genuinely democratic manner, the Dalai Lama said Sunday. The Tibetan spiritual leader, accused by Beijing of masterminding a separatist movement, is in Japan for a week at the invitation of a Fukuoka-based Buddhist organization. During a joint interview with Japanese media at a Tokyo hotel, he explained that envoys from Tibetan communities will meet for a week at Dharamsala, India, beginning Nov. 17, and international groups supporting Tibet will gather in Delhi later in the month to decide Tibet’s approach toward achieving “realistic autonomy” from China. Envoys for Tibet’s government in exile left India on Wednesday for talks with officials in Beijing, but the Dalai Lama said he hasn’t received word yet on how the meeting has been going. While he said he hasn’t given up hope or resigned from his position, the Dalai Lama said he could no longer take direct responsibility for discussions with Beijing, and decisions will be made based on a consensus of the people through a democratic process. The meeting of Tibetan communities and international organizations could alter Tibetans’ strategy with China, and the Dalai Lama said he intends not to talk of his preferences until the meetings are over. Tibetans believe in genuine democracy “unlike the communist democracy in China,” he said, explaining that “people may not express (their thoughts) freely” if he were to voice his position. However the Dalai Lama repeated during the interview that his ultimate goal is not to gain independence from Beijing but to make sure Tibet’s cultural and religious heritage is not destroyed. “We are not seeking separation from China” because remaining a part of the rapidly growing economy will help Tibet’s development, he said. Preserving Tibetan Buddhism and its ideology will benefit China as well, where “very dirty, corrupted capitalism” is emerging, he added. China has controlled Tibet since invading the region in the 1950s. Beijing has ruled its people through what the Dalai Lama described as “use of force to keep stability,” which has caused scores of riots. Frustration reached its peak this spring, when antigovernment monks rioted. The Dalai Lama criticized Beijing’s crackdowns on the Tibetan people during and after the clashes. Tibet “very much hoped that the Chinese government may see reality, and how many grievances are in Tibetan mind,” the Dalai Lama said, but he expressed disappointment that China has only continued to blame him as the mastermind of separatists and the riots. “There is an iron curtain within their minds, never seeing reality. Never seeing others’ views,” he said. “It is important to know the limitation of material value,” the Dalai Lama said, explaining that repletion of the mind is far more valuable than financial wealth. The Dalai Lama’s health has been a concern after the 73-year-old underwent surgery for gallstones last month, but he said that although the operation was complicated, he has surprised his doctors with his quick recovery. UPDATED – At the 7th Asian-European Summit (ASEM 7) in Beijing, October 24-25, 2008, Will Now China Teach The 27 EU States Capitalism and Preach in Asia The Demise Of The Wall Street Anglo-Saxon Model? CHINA IS REASONABLY CRITICAL ABOUT LACK OF SURVEILLANCE IN DEVELOPED ECONOMIES. Sarkozy Looks For A Solution That Involves a new G8+5 and a Joint European-Asian Trust Fund. The Update – What Place For Mongolia in This. BEIJING, Oct 22 (IPS) – Cast in the role of global saviour in the unfolding financial turmoil, China is playing host to a meeting of Asian and European leaders in Beijing this week that is expected to castigate the Anglo-Saxon model of capitalism and press for a reshaped global economic order. “Can Asia be global economy’s best hope,” asked an editorial in the Economic Observer last week. Noting that Asia hardly played any role during the global economic recovery after the Great Depression of 1929, the paper suggested that the continent’s established and emerging economies constituted the world’s best chance for recovery after the “financial tsunami”. “And even if the Wall Street demise does not instantly signify the triumph of Mahathir’s Asian model, it is the beginning of a much-needed readjustment of economic power in the world,” it concluded. More than 40 leaders will converge in the Chinese capital for the 7th Asian European Meeting (ASEM) summit from Oct. 24 to 25 to discuss the global financial crisis and a plan for joint action. Aside from the 27 EU countries, 10 ASEAN countries, the European Commission, China, Japan and South Korea, the summit will be attended by three other Asian countries — India, Pakistan and Mongolia. The talks will be co-chaired by France, which holds the European Union’s presidency, and China. China — a major emerging economy which sits on 1.8 trillion US dollars worth of foreign exchange reserves — has been looked upon as an important player to lead the way out of the global financial meltdown. U.S. Treasury Department officials and politicians have all called on Beijing to show a pro-active attitude and join efforts with the Western world to fight the worst financial crisis since the Great Depression. Qin Gang said Beijing had adopted a “responsible and constructive attitude” in dealing with the crisis. But few details have emerged over the role China is expected to play. Latest economic figures show that the country’s economy is also vulnerable to the effects of the global economic slowdown. The National Statistics Bureau said on Monday the economy expanded by just nine percent in the third quarter, the slowest rate in five years. By comparison, the economy grew 10.6 percent in the first quarter and 10.1 in the second quarter of 2008. The slowdown was blamed on plummeting demand for Chinese goods as consumers in the U.S. and Europe cut back on spending. In recent weeks Beijing has grown more critical over the lack of financial surveillance in developed economies, which it blames for the spiralling crisis. The deputy governor of China’s central bank, Yi Gang, who took part in the emergency G20 meeting in Washington earlier this month, chastised the International Monetary Fund for allowing too much leverage in the system and failing to exert control of big Western financial institutions. He told the media that “weak financial-policy discipline resulted in excess global liquidity and disorderly capital flows”. The line has been echoed in a numerous articles and columns in the Chinese media attempting to dissect the reasons for the downfall of Wall Street powerhouses. Some have sung an “eulogy to U.S. capitalism” while others have proclaimed the end of the “era of Washington consensus”. But there has been less certainty about what would replace the current order of international capitalism. “The demise of Wall Street Anglo-Saxon model doesn’t signify the victory of China’s financial modus operandi,” said a commentary in the 21st Century Economic Herald. According to Qin Gang the ASEM summit offers the “perfect platform” for leaders to discuss ways of dealing with the crisis. British Prime Minister Gordon Brown has proposed a global system of financial supervision that would empower international bodies including the International Monetary fund to monitor global markets and act as early warning systems. French President Nicolas Sarkozy — one of the summit’s coordinators — has pledged to use the meeting as a platform to persuade Asian nations to take part in a plan for the rebuilding of international capitalism. “What has happened is an act of treason against the values of capitalism; it is not a result of the market economy,” said Sarkozy during a speech Tuesday at the European Parliament in Strasbourg. “The most simple solution” for the global summits would be to bring the G8 (group of eight) largest industrialised nations together with the five biggest emerging economies, led by China and India, he told European politicians. Chinese analysts anticipate that the summit may produce an agreement for the establishment of a joint trust fund between Asia and Europe, similar to the one launched during the second ASEM summit in London in 1998, to combat the Asian financial crisis. The update comes October 31, 2008 to the original posting of October 25, 2008 and it deals specifically with the place of Mongolia in all of the above. This because of a breakfast meeting at the Asia Society in New York today, October 31, 2008 – the traditional Halloween day, and I will mention after a few further lines why I say this. The meeting today had the title – Mongolia Rising: The Incredible and Continuing Story of Mongolia’s Emergence as a Free Market Democracy. At the breakfast meeting spoke the US Ambassador to Mongolia, Mr. Mark C. Minton, and in the audience sat also Ambassador Ms. Enkhtsetseg Ochir, the Permanent Representative of Mongolia to the UN. Jamie F. Metzl, the Exec. VP of Asia Society chaired. Strangely, when I looked up the website of the Asia Society, I found that on October 31, 2005 The Asia Society Washington DC Center had a meeting on Mongolia. Here the strange coincidence of the Halloween date repeating itself exactly three years later and my possibility to compare the progress of relations between the US and Mongolia in the last three years – to the date. Strangely, already at that first meeting there was a reference to Halloween, but that was a very serious meeting – “US-Mongolia Relations: History and Future Prospects.” That meeting, according to the pdf had a large cast of Ambassadors participating, including Tony Lake, and it was arranged before President Bush trip to Mongolia – the first Summit of a US President with a Mongolian President. Since then there was a return visit – a Summit of the presidents in the Washington DC White House in 2007. Mr. Mark Minton, a career member of the US Foreign Service got to UlaanBataar in December 2006 after having served in Korea and Japan, so he was in Mongolia for the last two years of the US- Mongolia rapprochement. So why Mongolia? It is a country, the size of Alaska, of 3 million people, and 45% live now in the capital area urban environment. Culturally they are close to Tibet and are of the same religious belief as the Tibetan Buddhism, thus I would assume also close culturally to Bhutan, but they were a nomadic people. In the 20th century that brushed with Soviets, Chinese and Japanese occupation and are fiercely intent on preserving their freedom. Being geographically wedged in between China and Russia, they want that “third neighbor” that geography did not give them. So thy go the long distance and want the US as their third neighbor. To reach the US they developed their democracy so they can interact with countries beyond their two immediate neighbors. They reorganized their army as a peace making army and they participate in UN peace missions like Sierra Leone, and with the US in Iraq and Afghanistan. in exchange the US established an AID program involved in preventive health care and in construction workers education as the transformation from the nomadic lifestyle created needs for new skills in the housing sector; further the US Peace Corps are active in Mongolia – it is actually the largest per capita Peace Corps location. But obviously the US does not have Mongolia to itself, the Japanese foreign aid is the largest in Mongolia and the EU, Australia, and Canada are also active. Democratization made large progress – there is transparency, a judiciary, there are elections and they have a market economy and the leaders are involved in diplomacy. They are visited often by the Dalai Lama and the university is in exchange with the University of Alaska. Obviously, the US is interested in Mongolia’s mineral resources – so is China. Peabody Coal and Rio Tinto International are active in Mongolia. Hilton International opened this year. Mongolia is becoming a middle income country. It is landlocked but is starting to take advantage from its location by becoming a country of transit between China and Russia. In the democracy department there was a blemish recently when after the summer elections there were riots. The Ambassador explained those as inexperience because they have an army but not good police service. The fact was that the army, that was trained for peace work, did not know how to act when called in after the opposition protests about the elections. The authorities panicked and the army was inefficient. An adviser to Nature Conservancy criticised the ambassador as he said nothing about the environmental problems and the mining industry. Further there are issues resulting from foreigners buying up grazing land for meet production and farming. The nuclear issue came up as Mongolia wants to be part of the six Party talks on North Korea programs. Further, what was not mentioned is that Mongolia declared its nuclear-weapon-free status. In effect I have in front of me UN General Assembly document A/c.1/63/L.28 where Kazakhstan, Morocco, and Mongolia brought up together Mongolia’s rejection of nuclear weapons. Also, in recognition of their specific situation, Japan let Mongolia host one of the six-Party talks commissions. Japan is also looking into the problem with desert dust from Mongolia reaching Japan. From all this material, what is China doing when insisting in bringing in Mongolia to the meeting they hosted between the 27 EU countries and the four major Asian economies, when besides Japan, India and Korea, they also invited Pakistan and Mongolia? We understood Pakistan as sort of balance to India, but now we also figure that bringing in Mongolia has more to do with trying to redirect this country towards Europe and weakening a runaway relationship with the US directly, or via Japan. The bottom line is that because of size and economic potential, Mongolia is a country with much higher importance then it might be assumed from the mere 3 million people. China night then want to keep it in its own orbit and to guard it from “third neighbors'” exaggerated footholds. Since 2004, Japan Keeps Tracking Sand Formation in the Deserts of East Asia – Mainly China and Mongolia. Last Year on 34 Days the Sand Reached Japan – This Will Increase in 2008. Sunday, March 9, 2008, Kyodo News on Japan Times online. Yellow sand forecasts get longer. The Meteorological Agency is increasing its forecasts for yellow sand to three days instead of one, agency officials said Saturday. The agency will also supplement the forecasts by posting details about sand density on a map on the agency’s home page, they said. The sand, which has stirred concerns about health and the environment, was observed in Japan for 34 days last year. It originates from the deserts of East Asia. Forecasts for the sand began in 2004 by analyzing wind conditions, temperature and humidity in the desert areas. National Geographic Tells Us That Climate Change In Mongolia Ends Herding and Drives The People From The Steppe To Urban Environments. Climate Change Driving Mongolians From Steppe to Cities. Stefan LÃ¶vgren in Ulaanbaatar, Mongolia for National Geographic News. Namdag, who like many Mongolians uses only one name, is one of the hundreds of thousands who in recent years have abandoned their nomadic herding lives for an urban existence. While there are many reasons for the migration, observers say climate change is increasingly a driving force behind Mongolians’ move toward the cities. Landlocked between Siberia (Russia) and China, Mongolia is feeling the impact of global warming more than most regions in the world. Over the past 60 years the average temperature in Mongolia has risen by 3.4 degrees Fahrenheit (1.9 degrees Celsius). In contrast, the average temperature around the world has climbed only about 1 degree Fahrenheit (about 0.6 degree Celsius) in the past century. The warmer temperatures are drying up Mongolia’s grasslands, which provide food for the country’s livestock. “The Mongolian herding way of life is under threat from global warming,” said Azzaya, director of the Institute of Meteorology and Hydrology in Ulaanbaatar. Soil Moisture – With its hot summers and cold winters, Mongolia has one of the most extreme climates anywhere on Earth. It also ranks as the world’s least densely populated nation. On the vast steppes that stretch across northern Mongolia, miles often separate individual gers, which are moved by their nomadic inhabitants up to four times a year according to the seasons. Whatever his ex-wife may say about him, you have to admire Nicolas Sarkozy’s energy and cheek. Not only has he found himself, in record time, a glamorous new wife-to-be. He has also invented a new political ideology which will (he says) set France, and the world, on a rational course towards the salvation of the human race. President Sarkozy promises that he will “create a politics of civilisation to establish France as the soul of the new renaissance which the world needs”. After only seven months in office, the French president has not exactly abandoned everything that he has said and done until now. He has, however, turned much of his previous rhetoric on its head. The centre-right president has even commissioned two leftish-leaning, Nobel-winning economists to devise a way of supplanting Gross Domestic Product (GDP) as the true measure of human happiness and political success. Cynics might say that this idea, for a GDC or Gross Domestic Contentment register, is an attempt to change the rules of a game which M. Sarkozy was about to lose. On the other hand, President Sarkozy â€“ a brilliant, instinctive politician, despite his faults and oddities â€“ may have a point. The global zeitgeist has changed. The ideology of markets-always-know-best, and bankers-rule which has dominated the world since 1979-1980 is increasingly discredited. The idea that economic growth can be sustained indefinitely and must always be the measure of national achievement is under challenge from, if nothing else, the finite resources of the planet. So what does M.Sarkozy mean by the “politics of civilization”? Is it his own idea? Should we take it seriously? Is this new, somewhat leftish approach by a rightish politician the first sign, as some of his senior supporters fear â€“ that M. Sarkozy is being re-programmed by his highly intelligent, left-leaning wife-to-be, Carla Bruni? The “politics of civilisation” is borrowed from a brilliant, octogenarian French philosopher and sociologist, Edgar Morin. As a new way of looking at the world’s problems, it deserves to be taken very seriously. As an instant new political ideology or route-map, it has its limitations. M. Morin himself is somewhat bemused by the President’s abrupt decision to steal his idea. “The President is an elastic personality, always in movement. He hasn’t grasped yet how radical an idea a “politics of civilisation” would be,” M. Morin said. “What is going through the head of the President and his advisers is a complete mystery to me. Either this is just verbiage which means nothing or he has undergone some kind of profound conversion.” Edgar Morin, 87, is one of France’s most admired thinkers, a wartime resistance hero of Jewish origin, a former Communist, who has made his reputation with a series of books about the complexity of nature, the human mind and, er, everything. The phrase – the “politics of civilisation” â€“ comes from an essay, Pour une politique de civilisation, which he wrote with Sami Nair in 1997. As a new way of looking at the world, M. Morin’s ideas are interesting, even compelling. As a manual of practical politics, they might suit the British Liberal Democrats or the German greens. How do you sell such an approach to an electorate which has been taught to want more of everything? What on earth will be made of such ideas by the centre-right French president, a man hailed (quite wrongly) by the British right as a Gallic Thatcher? President Sarkozy, newly green, newly pink, and maybe newly-married, will take over the presidency of the European Union in July.